Exploring all the Xiaomi Mi 3 controls brings no surprises. On the front we find the 5" IPS 1080p display protected by a layer of Corning Gorilla Glass 3. Above the screen go the earpiece, the ambient light and proximity sensor, as well as the 2MP front-facing camera. Unlike most of the phones we get to review today, the Xiaomi Mi 3 brings back the capacitive control deck below the display thus not cutting off screen resolution. The trio uses the older arrangement with Menu, Home and Back keys. There is absolutely nothing on the phone's left side but things get busier on the right. The volume rocker is there, along with the power/lock key. At the top has the 3.5mm audio jack, the secondary microphone and the miniSIM tray. Moving on to the bottom of the phone we find the microUSB port right next to a huge grille hiding the loudspeaker and the primary microphone. The back of the device is where the 13MP camera lens and dual LED flash can be found. The 3,050 mAh battery hides beneath the polycarbonate rear shell and is non-removable. There is no microSD card slot on the Xiaomi Mi 3 either. Xiaomi has put a 3,050mAh battery inside the Mi 3, quite an impressive unit for a 5" device. 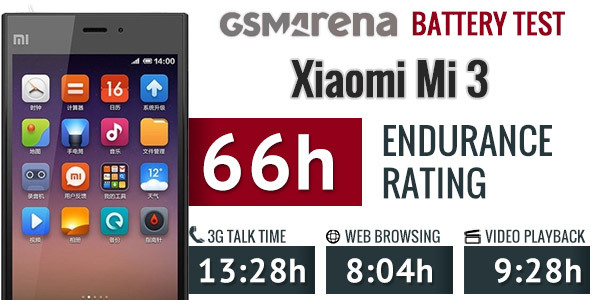 We ran our battery test and the Xiaomi Mi 3 scored 66 hours, which means you can count on few hours short of 3 days if you do an hour each of calling, web browsing and playing video per day. Note that we've tested the web browser test on Google Chrome, as the default MIUI browser crashed occasionally during our traditional battery routine. For a more detailed breakdown of the Xiaomi Mi 3 battery performance check out our blogpost. Our proprietary score also includes a standby battery draw test, which is not featured in our battery test scorecard but is calculated in the total endurance rating. 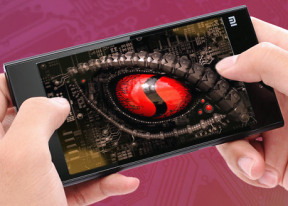 Even though the Xiaomi MI 3 runs on the capable Snapdragon 800 chipset it lacks LTE connectivity. It relies on quad-band GSM connectivity and quad-band 3G connectivity with HSPA support. The rest of the connectivity features include dual-band Wi-Fi a/b/g/n and Wi-Fi Direct. There is also support for Bluetooth 4.0, GPS and GLONASS, plus an FM radio. There is NFC connectivity, too, with support for Android Beam for sending files to other Android devices. There is a microUSB 2.0 port for charging and data connections. Media transfer mode is supported for accessing the phone's built-in memory and microSD card over a USB connection. There's also USB On-the-go for connecting USB peripherals such as pen drives, keyboards or real USB hard drives. The microUSB port doesn't have any TV-out functionality, but if you have a compatible HDTV, you can mirror your phone's screen wirelessly via the Miracast protocol.